A study abroad experience is a significant investment-and also one of the best investments for a student’s future. Semester at Sea allows you to earn up to 15 Colorado State University credits to be transferred to your institution. Over the course of the semester, you will sail to 10-12 destinations. All meals aboard the ship are included. Even on days in port. Meals are served buffet style three times a day. Vegetarian options are made available at every meal. A late night snack for a quick study break is also available most evenings at sea. Cabins are included with the fees as well as access to the gym, pool, spa, and other amenities. Prices vary by cabin. Crew Gratuities ($2 per day) are included with your program fees. Additional gratuities are always welcome and can be charged to the shipboard account during the voyage. The anticipated fuel fee based on our initial cost projections is included in your program fees. However, in the event of extreme fuel price fluctuations, Semester at Sea reserves the right to add an additional charge, or refund a portion of the fuel fee, with notice given no later than 30 days prior to departure. All students are automatically enrolled in one Field Class, or in-country educational trip, for each of their courses. Throughout the voyage, students will have shipboard support of a Student Life team including Resident Directors, Academic Dean, Executive Dean, Field Office Director, and a Medical Team. To help you prepare for you voyage, ISE will give you step-by-step guidance to apply for visas, gain medical approval, and complete all other pre-voyage requirements. Fuel Fee – Expenses are subject to change depending on global cost fluctuations. Review our fuel policy for more information. 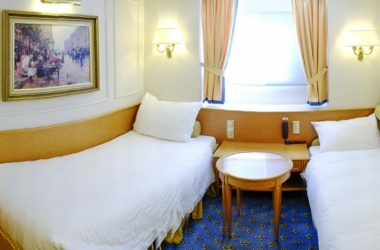 Inside Triple Cabins have three beds. All student cabins are equipped with a close-circuit TV, mini-refrigerator, closets (with hangers) drawers, a restroom (shower, toilet, shelf space), and a safe shared between cabin mates. Linens, towels and cabin cleaning are provided daily by cabin stewards. 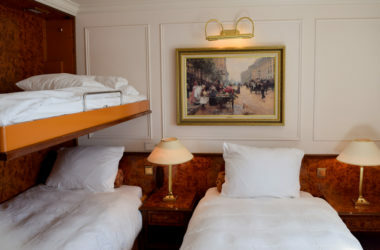 Inside Double Cabins have two beds. All student cabins are equipped with a close-circuit TV, mini-refrigerator, closets (with hangers) drawers, a restroom (shower, toilet, shelf space), and a safe shared between cabin mates. Linens, towels and cabin cleaning are provided daily by cabin stewards. 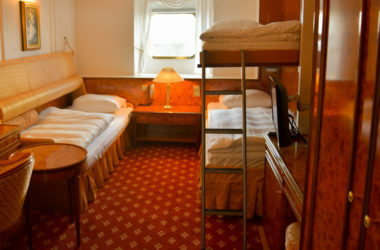 Outside Triple Cabins have a window, and three beds. All student cabins are equipped with a close-circuit TV, mini-refrigerator, closets (with hangers) drawers, a restroom (shower, toilet, shelf space), and a safe shared between cabin mates. Linens, towels and cabin cleaning are provided daily by cabin stewards. Outside Double cabins have a window and two beds. All student cabins are equipped with close-circuit TV, mini-refrigerator, closets (with hangers) drawers, a restroom (shower, toilet, shelf space), and a safe shared between cabin mates. Linens, towels and cabin cleaning are provided daily by cabin stewards. Program fees are subject to change. Spring 2020 rates will be reviewed by the Board of Trustees in May 2019. All cabin categories subject to availability. Expenses related to travel to and from the ports of embarkation and debarkation, textbooks, in-country travel, personal spending, and incidental fees are additional. Payment options include: check by mail, credit card (Visa, Mastercard, Discover, American Express), or E-check via MyVoyage. Please note that a 2.7% service fee will be added to all debit/credit card transactions (except for the $1,000 deposit payment and Field Program payments).